What started out as a cheap little project turned into a bit of a pricy effort, but I’m quite pleased with how it all turned out. A good bit of time spent on google and ebay finding workable parts and at least a half-dozen stops by my LBS. Thankfully, Bothell Ski & Bike has a resident Single Speed Expert in their head mechanic Donny Love. He was nearly as jazzed about some of the parts as I was. Highlights of the build after the jump. I started with the frame and that’s about it. The 26.2 seatpost was hard to find a solve for, but luckily Origin 8 has some nice parts for tough to find sizes. 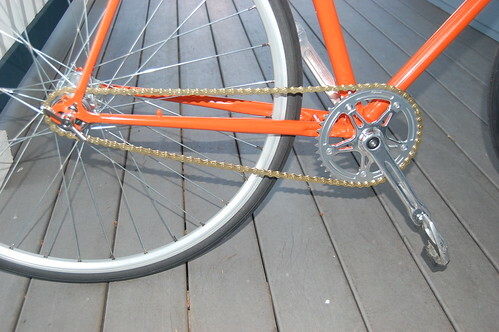 Much of the other trim was found at Velo Orange. A cool little operation in Annapolis, MD with tons of retro gear. I have gotten a ton of attention for their Stainless Steel Wingnuts (Donny’s favorite for sure). 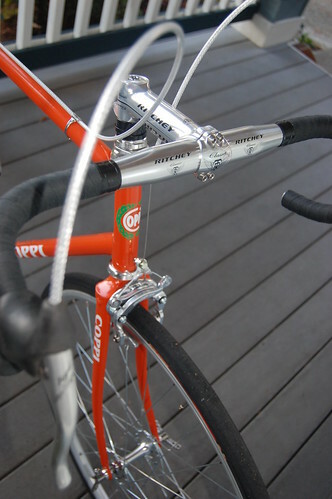 From there I went with the Ritchey Logic Classic Bar/Stem combo. For the brake calipers I ended up going with the Dia Compe 610’s that I’d been obsessing over. 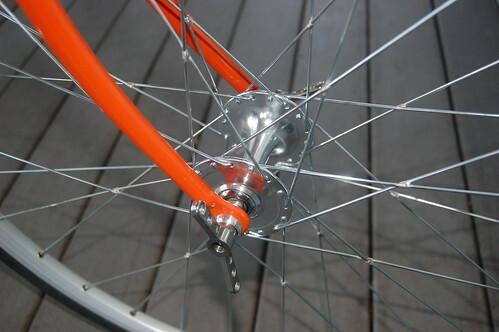 The wheels are pretty bare-bones fixed gear high-flange wheels setup with an ACS freewheel. The other hard part was Italian threaded BB, but a need for JIS square taper to work with most all current cranks, and again it was Velo Orange with the fix. 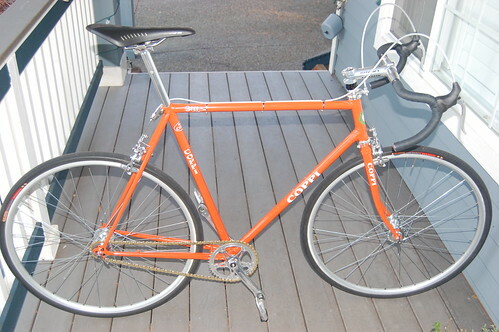 I looked at a number of cranks, and looked at quite a few setups, but since I was going with a single-speed build, the FSA Gimondi was a great solve. KMC Chain, an old Campy Headset that I had, and of course the Fizik Arione and I’m ready to roll. Oh, except the cool 28mm Challenge Roubaix tires that a friend gave me. So – apart from a 20mm silver headset spacer the bike’s a done deal. Ready for some more sunny winter rides. A special thanks to my Dad for giving me this bike when I was 16 and starting me into this crazy life sport, and to my childhood neighbor Billy for helping me out and teaching me the ropes.